Apparently a lot of anti-gun groups think hunters losing their hearing is just fine. I also like the notion the media is parroting that silencers put Bambi at a disadvantage. That’s because many people graduating from journalism school know about as much about how the world works from that point of view as a raccoon does. See, bullets fired from hunting rifles travel faster than the speed of sound, meaning if the hunter has any skill, Bambi is mortal before she even knows what hit her. Bullets also make sonic booms, which means suppressing a hunting rifle is more useful for protecting a hunter’s hearing than masking the sound from wildlife. Any wildlife in the vicinity will definitely hear the shot once the supersonic shockwave caused by the bullet reaches their ears. Given the number of comments you read wishing gun owners dead, it seems rather magnanimous of anti-gunners to compromise at deaf. 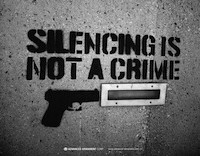 Silencer laws are another one of those stupid laws based on anti-gun hysterics. Heck, I’ve seen a single-shot .22 rimfire Lee-Enfield training rifle that was so quiet firing CB caps all you could hear was the click of the striker stopping and the buzzing sound of the bullet passing downrange. Click-wzzzz! Click-wzzzz! No ‘silencer’ needed. Unfortunately this appears to be human nature, its not just liberal anti-gun media. They are in a unique position in that it is their job to do so and, historically, have been in a leveraged position to reach a wide audience. Shooting a gun while wearing earplugs gave me hyperacusis (a condition which can turn your life into absolute hell). Everyone should shoot with a suppressor. I have tinnitus in both ears (altho the left one is worse) and progressing toward deafness in my left ear, already have lost higher pitched sounds completely. Why does our govt regulate a muffler that can alleviate this in a country which guarantees gun rights, while in countries where guns are all but banned they are nearly, and in some cases actually, required to be used? This makes no sense to me…. It’s government. It doesn’t have to make sense. In fact, generally, it won’t. But it will generally serve the interests of those with something to gain. Here, those to gain are politicians who can grandstand that they are preventing “criminals” from committing offenses. It’s not the case, but it doesn’t prevent the grandstanding; the public generally doesn’t know the difference.